What makes a sewing project blog-worthy? I wondered whether to bother adding a little post for this at all. There's nothing noteworthy about it in a technical sense as it's as simple as sewing gets and there's no anecdote behind making it or using it. But, I love the fabric and the embroidery, so here it is! Yep, it's just a basic lined zipped pouch. 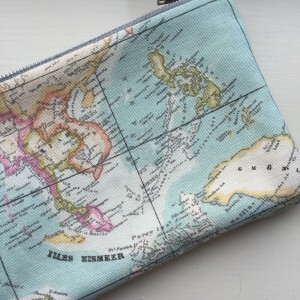 The map fabric was a free sample from John Lewis over a year ago, and I came across it during a recent clear out. I thought it was a decent size for a zipped pouch that I could use in place of my wallet sometimes. 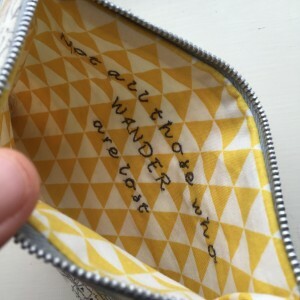 I found an offcut of the yellow and white geometric fabric, from a skirt I made for Eleanor, and the zip was from my Sew Brum goodie bag. It may be a simple little project, but I love it. I've used it a lot too; I can fit my iPhone 6, lipstick, money and even my keys inside and it still fits into the pockets of my dresses! Did you see my interview with The New Craft House? Don't forget to use the discount code, it's valid until the end of this month!